Peter Biggs of The Light Magazine is researching one Metro Vancouver / Fraser Valley municipality each month, and producing a focus on each one. 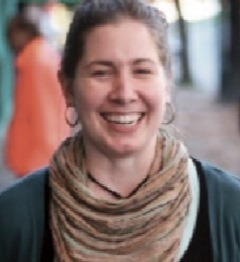 The October issue brought attention to the Downtown Eastside and a feature interview with Jacqueline Dewar, who has worked and lived in the DTES for the past three years. Dewar attends Grandview Calvary Baptist Church and co-directs Jacob’s Well, a Christian community that seeks mutually transforming friendship with people on the margins of society and equips others to do the same in their own context. Their Life on the Margins workshops, for instance, are not to be missed. 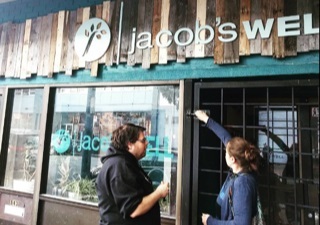 Last summer, when they faced eviction from their Main Street location, Jacob’s Well made the following video describing their life together in the neighbourhood; they have since found a couple of years reprieve by leasing 543 Powell Street from Mission Possible. Q: Over these recent years in the community, what strikes you as the main changes? JD: There is an increase in aggression on the street. One factor is gentrification. It has a number of consequences. It squeezes people into a smaller and smaller area, with stores coming in that do not cater to or tolerate the poor. It makes the poor feel like their neighbourhood is being taken from them. There is just so much grief around. With the high number of deaths [due to Fentanyl overdoses], people have lost lots of friends. Then there is the closure of programs. I think of the Drug Users Resource Centre that provided essential ‘life-skills’. It was closed and merged with another resource focused on mental heath issues – ‘The Living Room.’ [It is now called ‘The Powell Street Getaway’.] Both groups lost out. Q: A Vancouver Sun study found that over $1 million is spent by over 200 social agencies daily. Why don’t we see more change in the DTES? JD: The neighbourhood operates in constant ‘crisis mode’ all the time. Plus governments change. There needs to be a longer-term vision and plan for applying the Four Pillars strategy – prevention, treatment, enforcement, harm reduction – to address substance abuse. Tons of money has gone into harm reduction because of the crisis of deaths. Q: What most needs to change? JD: Detox availability. Many of our friends at Jacob’s Well come to the point in their lives of wanting to end their addiction(s). Oh, there’s a number they can call about detox. But they find they have to wait one to three weeks. Many of these people don’t know what day of the week it is, let alone be able to deal with an appointment. Also by that time their motivation has likely passed. But increasing the availability of detox would be expensive. Q: Squalor . . . it annoys and baffles many of us as to why accommodations and presence on the street always seem to produce so much garbage, filth and squalor. JD: The vast majority of people we see are living with the long-term effects of significant trauma. PTSD impacts an individual’s daily functioning. It comes down to a basic lack of emotional wellbeing. There is a phenomenal incidence of hoarding. Q: How does one help people like this? JD: The vast majority grew up in foster homes with no stability. Add to this being repeatedly abused, they then ‘medicate’ their pain. It all rewires the brain. We find a lot of people have borderline personality disorders. Almost all have no family support. There are hopeful developments! Counselors employ Dialectical Behaviour Therapy, which helps people develop skills to avoid dysfunctions when they occur. Q: What attracts people to such a decrepit, dysfunctional neighbourhood? JD: Well, there is a high concentration of services. Some SROs [Single Room Occupancy hotels] have arrangements with the courts – so it is an easy transition. Also, lots of people are simply ignorant that there are any other places. Sometimes they move only to return. I remember one man who lived in Stanley Park. He was the equivalent of a highly traumatized five year old in a 45 year old body.